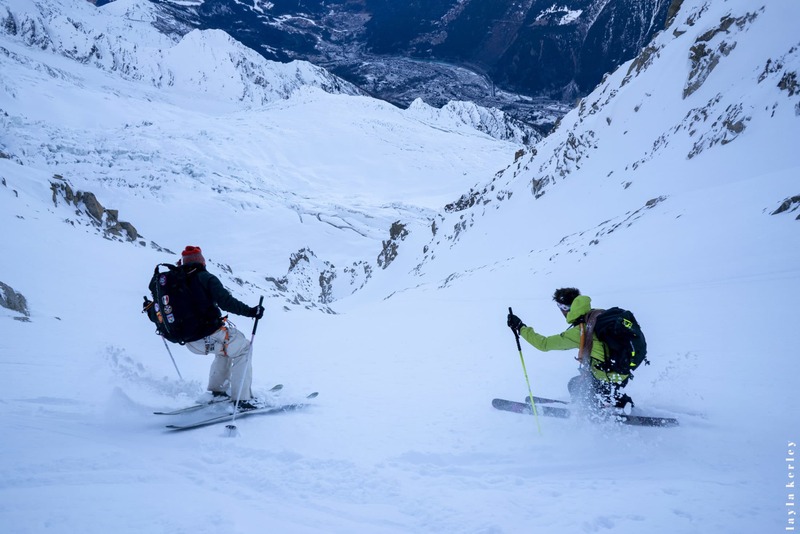 Initially entitled From my point of view, this text by Bruno Compagnet recounts an almost normal day in the Mont Blanc massif. Almost because , without doubt, installing oneself on a 50° slope of hard snow, the ordinary can soon transform in wondering what you have let yourself in for.. Eyes wide open, I stare at the profound darkness of the bedroom. It is 3:17 in the morning and I couldn’t sleep. I wanted to go back to sleep before the waltz anxious doubts about my future began preventing me, definitively, from diving back in to my oneiric world. 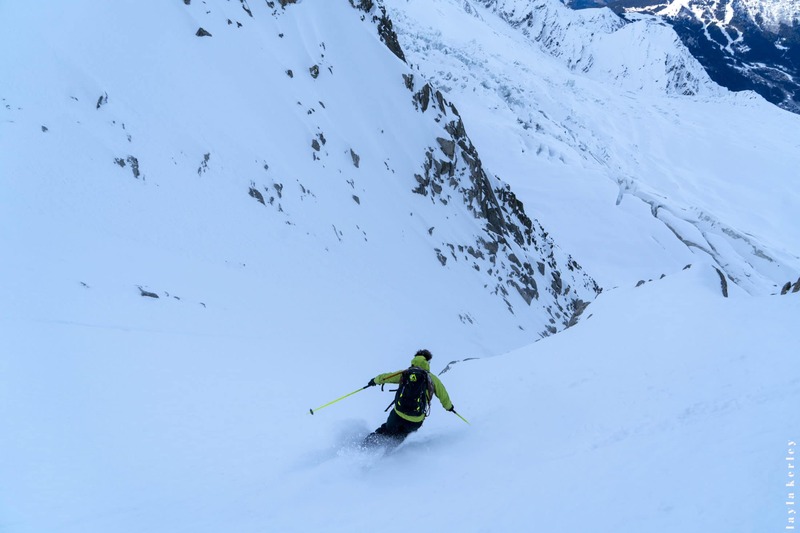 During the winter holidays, at peak period, the town of Chamonix transforms in to true chaos. The pavements are obstructed by holiday makers who have difficulty moving around with their ski equipment or their magnificent shopping bags in effigy to these great brands who have capitalised the world capital of mountaineering. The road traffic is so intense that each year we create new record levels of pollution. Going in to town for a drink or doing one’s shopping has become an ordeal which I have renounced. It was 7.45, the sky was pale blue and devoid of any clouds. 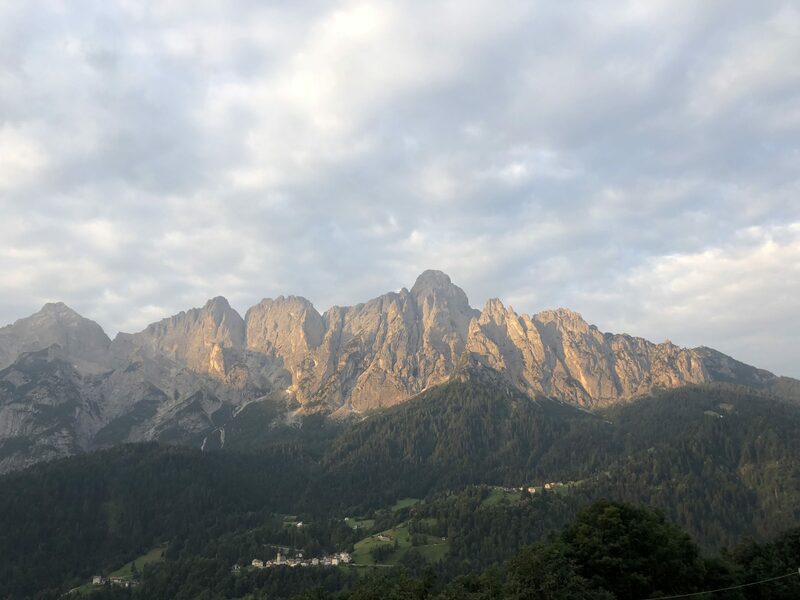 I went out on to the terrace to finish my coffee and look at the Chamonix Aiguilles. I was wearing a jumper and I wasn’t cold, troubling for the end of December. We were but a handful of skiers in the queue for the Aiguille de Midi cable-car. Many Asians and a group of people whose nationalities I would have had difficulty in defining. The ridge was not equipped and wearing crampons we descended peacefully. Once kitted up on the sunny side, the snow cold, soft, smooth and regular we immediately got in to the mood. François who had suggested a « beautiful Cosmique » to us had disappeared on the right. A rapid glance between the rocks, to the left of the gully entrance, surprised us. There was a lot of snow… But it seemed to be hard. I told Layla to get her ice-axe out and to stay behind me. Several side steps and it was time for the first turn. I concentrated hard, shoulders facing the line of the slope. I said nothing and went for it. « Yes, okay, I feel good. 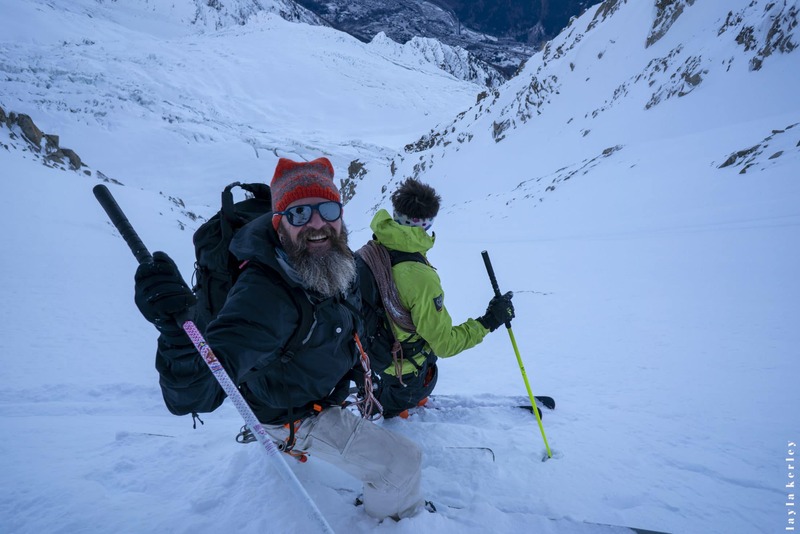 » We rejoined François while side stepping, ice axes in the hand and, despite the correctly sharpened edges, we had difficulty gripping the refrozen crude which had vitrified the start. The usual rappel ring was under the snow and, after trying to extract it with an ice-axe, François installed a runner on an old cable trapped in the snow, ice and rocks which seemed to have good anchorage. A length of fifty metres of double rope brought me to the end of the rocky section. I unclipped. « FREE ! » I started to carve a small platform for Layla. The reason for my fear wasn’t directly linked to the slope, but the refrozen crud which seemed to continue over a distance which I couldn’t evaluate, all the time trying to get rid of my feeling that we were maybe making a big mistake. Layla joined me and reassured me by telling me she was okay. 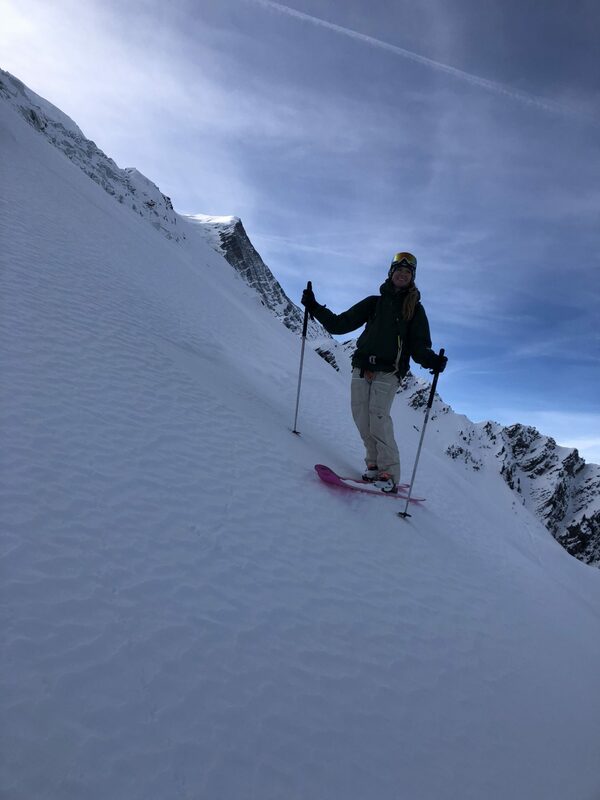 Several more metres of side stepping, and a jump turn under tension, further, I recrossed towards the left on snow which was truly frozen where my skis lost their grip and at last found a small band of fresh snow. The perfect snow for the old method of slope skiing. 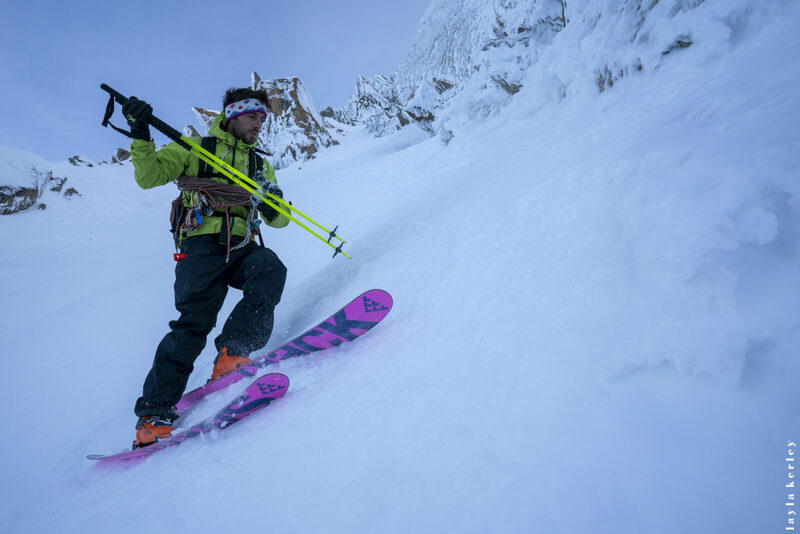 Because, if many people can ski a 50° slope in powder, the same slope on hard snow is a completely different story. The powder consumes the slope. It is one thing to ski the slope alone. As a couple, it is a different story. Even if it is an incredible feeling to share it with your partner, if it goes badly, the perspective of having to announce the drama to her parents petrified me. Those are the things on which one prefers not to dwell, but are the things which one feels and which sometimes pushes one to make a u-turn which, rightly, if it is not the day, a bad night or the gusty wind blowing on the ridges which look unpromising. François joined us, very calm as usual. I told him that the snow was now soft and regular like sugar. After the first turns still a little restrained, we penetrated this bubble where each turn becomes a rhythmic and mysterious dance in harmony with the snow and the configuration of the terrain, and one is in harmony with oneself. I have learnt a lot about myself through skiing in the mountains. 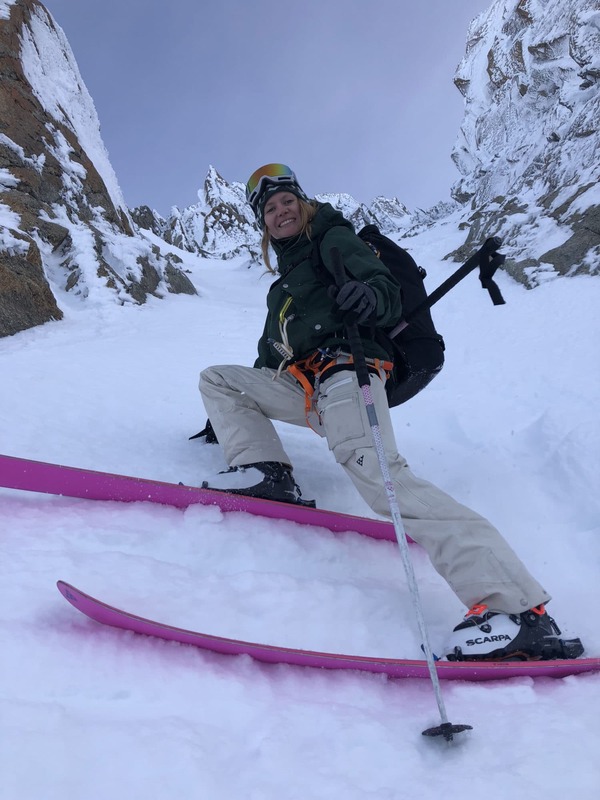 It is a true moment of sharing where, as well as one’s personal and egoistic pleasure as a skier, you also have pleasure in watching others doing it. Almost like a sexual thing. There were only three of us and we had an absolute ball during this incredible descent which, despite the trivialisation, remains a world-class line. 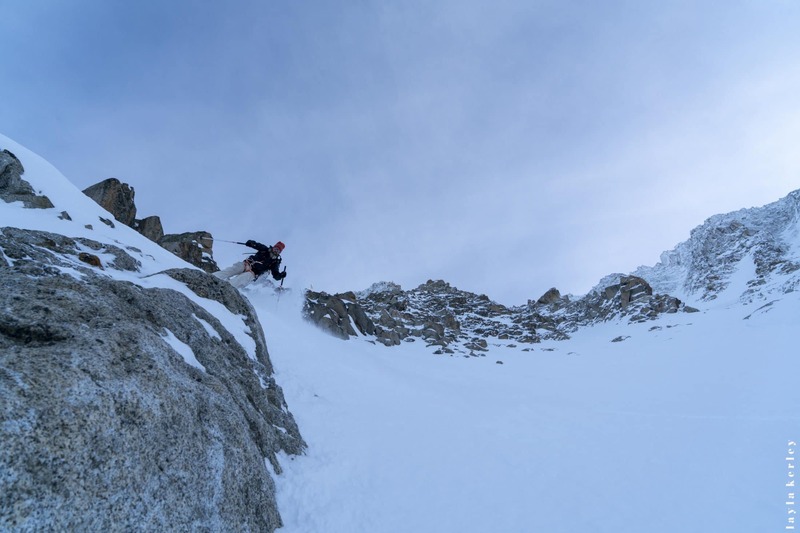 The adrenaline at the start exacerbates our feeling on the snow and, except for the hard part at the summit, there wasn’t a turn which wasn’t as good as you’ll get. 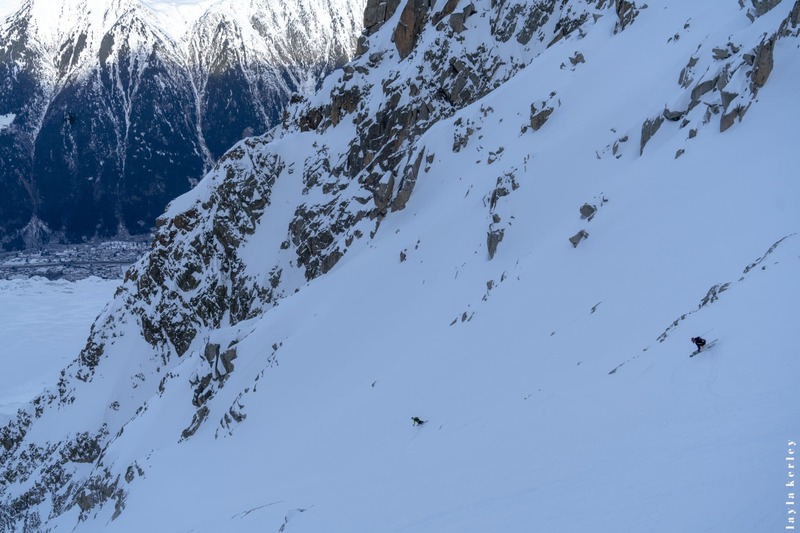 I have skied this gully an incalculable number of times. The first was with Marco Siffredi, at a time when we were fewer in number who went there regularly. I have often ridden it in deep powder in epic conditions, however this descent surpassed us. Was it because it was the beginning of winter? Was it the ambiance, the quality of the snow? We took the direct exit via the Bossons glacier to finish along a small path on the flank of the moraine which led us to the Cero hut. Walking with skis on our packs, I asked myself what sense there was in taking this kind of risk in the mountains. 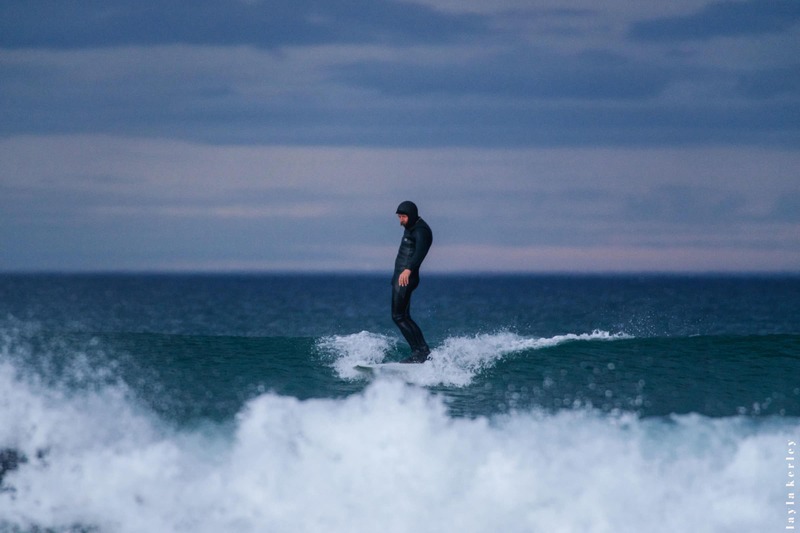 I have truly wondered about our neurosis, thinking that no man with a life connected to nature would take this kind of risk to «feel good». And yet, I think it’s sometimes worth rubbing it in (because humans sometimes need to stimulate their adrenaline, it’s an old way of staying healthy…). 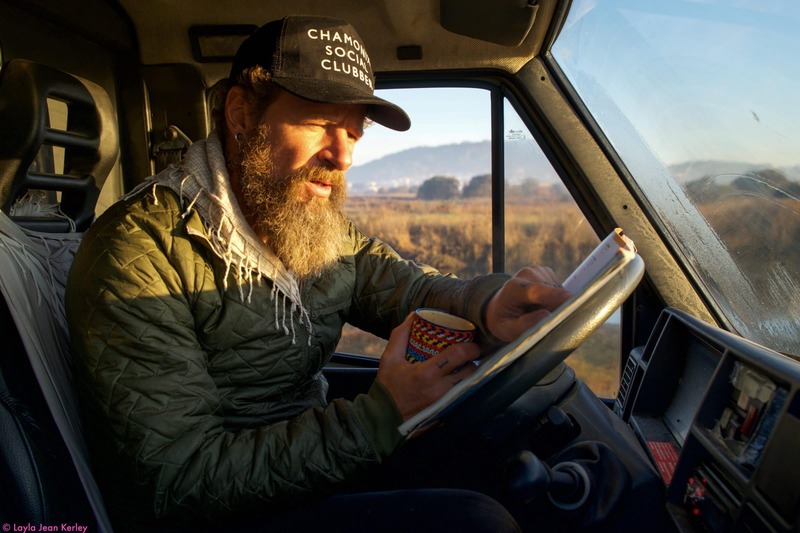 Julien Casagrande, in his van, came to fetch us from the tunnel. Then, François invited us to put the world to right while eating a magnificent beef and onions accompanied by a magnum of natural wine.